I am writing to say that you are truly skilled in the art of absolutely painless injections. I am 60 years old, and I have met more than my share of dentists. The novocaine (Lidocaine? Pontocaine? Whatevercaine!?) injections went from stinging to feeling like someone had just stuck a ballpoint refill in my gum. With you, however, I don't know when you are giving me an injection. Seriously! One minute my mouth is open, next minute it's numb. I can't explain how that happened! 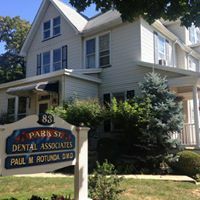 As a patient of Dr. Rotunda's for at least 15 years, Ialready knew that he and his office staff provided excellent preventive and maintenace care of my and my family's teeth. It was not until I was truly in distress, however, that Ilearned how valuable he is. When a craked tooth developed into an infection, and I was miserable, at work, and needing to see him within a 2 hour window, he was able to work me into his schedule. He took care of me and had me back at work with 15 minutes to spare. The next day was a Saturday, and when I felt a little worse than I had anticipated, I called him, at home, and he was able to guide me through that crisis, too. He is adided by a superior office staff, who make my concerns, their concerns, and seem to always have time to spend on whatever I need. The quality of his work is of the highest standard, and I feel confident that my teeth will be around for a long time! Since the bite adjustment I have noticed a difference in many areas. Just the simple act of chewing food is a whole new experience. There is no more "popping" sound and all teeth are involved in the process. I think the most amazing thing, however, is the number of people who have commented on how I look more relaxed and some how "different". I would highly recommend this procedure. Dr. Rotunda is one of the most thorough and attentive dentist that I have in years. He has really taken his time with me: he listens and addresses all of my concerns and he is very compassionate. He proceeds very methodically and I especially appreciate knowing that he is not arrogant in any way. I have trusted Dr. Rontunda for a root canal and two crowns, all which he has handled very thoroughly without being dismissive. He has a gift for treating a patient as a person. I suffer from TMJ, tempero mandibular joint disorder. Until I began seeing Dr. Rotunda, I was not having much success with other dentist who do not know how to treat the condition. Simply put, TMJ means that I have a severe form of grinding my teeth in my sleep which overworks the jaw and facial muscles and which can result in a lot of pain if it's not kept under control. In my case, the TMJ is brought on by muscle tension. Before my first appointments Dr. Rotunda squeezed me in early upon my request to evaluate my condition and he even called me the next morning to ask how I was feeling. I was already wearing a mouth guard to bed and he began by taking an x-ray and making adjustments on the mouth guard so I would not have so much pain. Those early efforts on his part had a positive impact. One thing that we also discussed for a quite a while was the possibility of adjusting my bite. I was skeptical at first. My bite was out of alignment from grinding and he explained to me that the more we could balance my bite, the less I would be grinding and the less pain I would have. Once the bite is out of alignment, tendency is to grind even more and have more pain in the end. He took impressions of my teeth and he demonstrated with the impression exactly what he would do. When he showed me what the procedure would involve, I was able to make an informed decision. A bite adjustment involves filing down certain teeth so they all hit each other evenly when you bite. After having the bite adjustment, I have had a lot less pain in my jaw and facial muscles. My bite was not far off but it's amazing how a minor adjustment can make a huge difference over the long run. When it comes to going to the dentist, I am usually very nervous. However, Dr. Rotunda really knows how to make a person feel comfortable and very relaxed. He's taken the time to first listen to all of my concerns and fears, and then has always given me a list of options when it comes to my dental treatment. I like that I can decide on what I feel is right for me, instead of doing something that I do not completely agree with. Dr. Rotunda has always given me the best service and I will recommend him to anyone. When Dr. Rotunda introduced the idea of a bite adjustment, I was a little hesitant. My initial thougt was, "how can something so simple make a difference"? I noticed the difference as soon as he finished. As I was making my next appointment, my bite was different. I was able to feel my teeth evenly against each other. Throughout the two weeks between appointments, my jaw felt relief! I had'nt realized how sore my jaws were prior to having this done! Now after finishing the bite adjustment, I can really feel the difference. My mouth and jaws are relaxed and pain free! The procedure itself was easy and painless. This procedure has made a dramatic difference! I now know what a "normal" bite is supposed to feel like. I have known Dr. Rotunda for almost twenty years and had worked for him for five of those years. My experience with Dr. Rotunda as both an employee and a patient has been of total satisfaction. Dr. Rotunda will never settle for less than perfection and the patient is the beneficiary. How fortunate are we to have found a dentist who is both qualified and caring. His honesty prevails as a professional and associate. When you sit in Dr. Rotunda's chair, your worries are over, because you know you have found the best. Having my bite adjusted had a major impact on the health of my mouth-both my teeth and my gums. I had a problem with bruxism (tooth grinding) and was going to loose a tooth because of it. In fact, my former dentist was about to pull the tooth. That is when I first came to see Dr. Rotunda. The first thing he did was adjust my bite; this allowed us to save the tooth for at least another 10 years. I had also had periodontal disease at a fairly young age, as well as a problemwith TMJ. All of these conditions were helped, ot not eliminated, by having my ite adjusted. The process was slow, but it was well worth it. I felt it ws the first time a dentist had ever taken a positiveapproach to my dental health, with the goal of reducing the number of future dental procedures. I have seen the long-term benefits of having my bite adjusted. I believe my overall dental health had continued to be very good because of it. About a year ago Dr. Rotunda introduce me to the Showerfloss which is the most sanitary approach to removing food particles and plaque from between my teeth. Connected to the shower head it gives me a hand regulated temperature and pressure stream of water to flush between my teeth. Thank you Dr. Rotunda for recommending this safe, holistic, made in the USA product which has improved my dental health. Five years ago Dr. Rotunda noticed gum recession during my exam. There was a possiblity of gum surgery, but I was skeptical about this procedure and asked if there were any other alternitives. Dr. Rotunda recommended three hygiene visits a year along with good home care. I've had been faithfully keeping my appoinment with wonderful results. Therefore avoiding gum surgery. I'm happy to say that his advice proved to be correct.